Why a Software Developer Firebrand Apprenticeship? You'll be ready for anything. IT apprenticeships teach and test the core skills that enable you to work effectively across a range of products. Once you've mastered the main concepts, you’ll extend your skills in current and future technologies used at work. It makes you better at your job. Firebrand's programme helps you develop new knowledge about your job, gain new skills and embed new behaviours to help you make a greater contribution to your employer. Great results. Firebrand's training delivers some of the best results in the sector - over 90% retention for the past two years, a 95% pass rate across all standards (national average 90%) and 46% of apprentices achieving Distinction (national average 30%). What is a Software Developer Firebrand Apprenticeship? A suite of Firebrand's proprietary training courses, delivered at our state-of-the-art facility in Wyboston Lakes, Bedfordshire. Courses cover all requirements of the knowledge modules for the standard, ensuring a strong grounding in the core skills of the role. Once all knowledge exams are complete, apprentices will have the opportunity to undertake a course of their choice, providing additional depth of knowledge and (where applicable) professional certification. Firebrand's resident authorities on all areas of the IT industry will host subject-specific webinars, advise on project development and provide additional live learning and masterclasses to support all levels of learning. This gives apprentices the additional knowledge and insight needed to turn a passing grade into a Merit or Distinction. We support the personal development, behaviour and welfare of all apprentices through accredited online programme Impact. This video-led modular course will help apprentices develop their awareness and understanding of challenges they may encounter in the workplace and wider society. Learning content is linked to current events to provide real-world context. On completion of Impact, apprentices receive certification that contributes to their summative portfolio of evidence, showing how they have fulfilled key behavioural development criteria of the standard. When not undertaking formal training, apprentices will be learning at work, applying their skills to business-specific projects and gaining a deeper appreciation of their role and business through off-the-job activity. They also undertake a six-month professional behavioural programme, Impact. Learning Journey – the apprentice undertakes formal and informal learning over 13 months, covering, applying and recording all the competencies required to pass their apprenticeship. Residential training, online learning and Subject Matter Expert sessions will be spaced regularly, giving apprentices time to apply one skillset effectively before learning another. Progress is reviewed during formal sessions approximately every 8 weeks. End Point Assessment – the final review, conducted by an independent body, of whether the apprentice has met all the competencies required to pass the standard. This includes a reference from the employer, portfolio of evidence, synoptic project and final interview with an assessor. End Point Assessment activities are completed over approximately 12 weeks. Who's on hand to help? Firebrand provide wrap-round support to ensure apprentices' technical, learning and personal needs are met. Every apprentice is supported throughout their qualification by a Learning Mentor, a former industry professional who understands exactly what it's like to work in the sector and can advise on how to evidence the required knowledge, skills and behaviours through the work apprentices do every day. Our Course Instructors deliver residential training, while in-depth information on subject-specific topics and industry insight is provided by Subject Matter Experts. Undertake further professional training to develop additional product knowledge and skills. Visit Firebrand's commercial training pages for details of how our accelerated training could support life after an apprenticeship. Feedback shows our approach is delivering the tangible benefits outlined above for both employers and apprentices. We are proud to work with and receive great recognition from our customers. Today we're actively helping employers and apprentices acquire better skills, be more engaged and make clear contributions to their business outcomes. Software Developer apprentices are taught how to build and test simple, high-quality code across front end, logic and database layers. They'll be able to interpret design documentation and specifications. Demonstrate competence against two knowledge modules: Software Development Methodologies and Software Language. These are assessed by examinations set by the British Computer Society and regulated by Ofqual. Apprentices must pass both modules. Submit a portfolio of evidence showing how they have applied the knowledge from these modules to projects and activities in their workplace. Complete their formal End Point Assessment, which comprises: a synoptic project to showcase knowledge and skills from across the apprenticeship; a review of their portfolio of evidence; and a final interview with an independent EPA assessor. Successful Software Developer apprentices go on into roles such as a Web Developer, Application Developer, Mobile App Developer, Games Developer and Software Developer. operate at all stages of the software development lifecycle, with increasing breadth and depth over time with initial focus on build and test. Apprentices will achieve one BCS qualification and one vendor qualification. The duration of this Firebrand apprenticeship is 13 months. We recommend that apprentices are employed for a minimum of 16 months to ensure that their employment covers the End Point Assessment. Once apprentices have completed their apprenticeship they are officially recognised by the British Computer Society (BCS) for entry onto the Register of IT Technicians, confirming SFIA level 3 professional competence. What are the benefits of a Software Developer apprenticeship? Firebrand’s digital apprenticeships deliver new skills while supporting both the individual and their employer. Benefit from award-winning training supported by on-going guidance along the way with digital apprenticeships that create valuable, long-lasting employees. Improved retention rate - 69% of companies say digital apprenticeships improve retention*. Apprentices are completely engaged by employers, knowing they’re highly valued employees. Employees find themselves in a marketplace where their hard-won digital skills are highly valuable and in demand. Always learning - 73% of digital apprentices expect to undertake further study within two to three years*. With increasing digital transformation, apprentices continue to master new technologies and processes. Having digital workers that are focused on developing their skills will better position businesses around new technologies, like updated cloud platforms. Tailor your training - Get business-specific skills alongside apprenticeship requirements. The flexibility of Firebrand’s delivery allows employers to select training options that align most closely with the existing technology stack to work on current projects. Where applicable, employers can embed specific vendor products, like Microsoft, into apprenticeships to deliver a greater depth of learning. Happier employees - Apprentices feel valued with their new digital skills. 78% of digital apprentices reported improved job satisfaction, job security and career prospects*.This satisfaction increases productivity and happiness in the workplace, benefitting employers by increasing employee engagement. Networking and peer learning - Firebrand’s residential training centre delivers award-winning public courses to industry professionals. Learning takes place alongside individuals from different organisations with varying levels of experience. Apprentices benefit from receiving a valuable insight into how their skills are applied in different contexts. Real world skills - Apprentices benefit from learning up-to-date digital skills in a time of rapid digitalisation. They develop technical knowledge and industry insight through practical learning and real life application. Become an expert in different technologies and a valuable asset to the team. Investment in your career - Digital apprenticeships are a career investment – with Firebrand you’re committing to the highest quality IT training. This investment is the first step toward a rewarding future with an employer as they commit time and money in the learner's skills development. Digital apprentices feel so valued in their workplace that 89% of them said that they want to stay at the same employer for the next two to three years*. Learn while at work - An apprenticeship combines a full-time job with formal learning. New and existing staff can benefit from the opportunity to learn while continuing to work, getting new skills without having to study on evenings or weekends. Support a career change - Digital apprenticeships provide the skills to move into new IT roles, giving more control of the learner's digital career path. Move seamlessly between roles in an organisation without experience of a particular field, or using experience of other digital roles in a related field. Never forget again - Digital apprenticeships reinforce learning. They’re built on the principle of learning and immediately using skills that will help apprentices do their job better. Quality programmes incorporate structured training and project activity to apply and demonstrate new skills. 90% of regular learning is forgotten within 3 to 6 days, unless it’s regularly reinforced. Firebrand’s training style helps gain skills more quickly, retaining and using them more effectively. Firebrand’s apprenticeship programme covers all mandatory knowledge and skills outlined in the apprenticeship standard. Every Firebrand apprentice attends a suite of market-leading training programmes, to cover knowledge required from the apprenticeship standard. This training is then fleshed out through a package of selected online learning, which also allows apprentices to explore any topics of particular interest/importance to them in greater depth. Apprentices receive a range of market-leading training as part of their qualification – typically between three and five courses per apprenticeship - giving them fundamental skills at speed. We'll deliver all the knowledge apprentices need to learn for each knowledge module in the Standard through our Lecture | Lab | Review delivery. Apprentices then attend a Syllabus Review Session to cover the knowledge content covered in the apprenticeship standard. The information below outlines the training curriculum delivered for each Knowledge Module through Firebrand's residential classroom-based training and online learning modules. Read through the full curriculum for Firebrand's classroom-based training and supporting online learning modules below. Read through the full curriculum for Firebrand's classroom-based training and choose one of the following software languages below. The chosen curriculum is supported by an online learning module. This module reviews the basics of HTML and CSS, and introduces the tools that this course uses to create HTML pages and style sheets. Explain how to use HTML elements and attributes to lay out a web page. Explain how to use CSS to apply basic styling to a web page. Describe the tools that Microsoft Visual Studio provides for building web applications. This module introduces HTML5, describes its new features, demonstrates how to present content by using the new features in HTML5, and how to style this content by using CSS. Describe the purpose of and new features in HTML5, and explain how to use new HTML5 elements to lay out a web page. Explain how to use CSS to style the layout, text, and background of a web page. In this module, you will examine the properties and values defined in several of these modules, the new selectors defined in CSS3, and the use of pseudo-classes and pseudo-elements to refine those selections. This module describes how to create interactive HTML5 web applications that can access the local file system, enable the user to drag-and-drop data onto elements in a web page, play multimedia files, and obtain geolocation information. Access the local file system, and add drag-and-drop support to web pages. Play video and audio files in a web page, without the need for plugins. Obtain information about the current location of the user. Use the F12 Developer Tools in Microsoft Edge to debug and profile a web application. In this module, you will learn how to use these technologies to create robust web applications that can continue running even when a network connection is unavailable. In this module, you will learn how to build a website that adapts the layout and functionality of its pages to the capabilities and form factor of the device on which it is being viewed. You will see how to detect the type of device being used to view a page, and learn strategies for laying out content that effectively targets particular devices. This module describes how to create advanced graphics in HTML5 by using Scalable Vector Graphics (SVG) and the Microsoft Canvas API. You will learn how to use SVG-related elements such as and to display graphical content on a web page. You will also learn how to enable the user to interact with SVG elements through the use of events such as keyboard events and mouse events. The Canvas API is somewhat different than SVG. This module describes how to enhance web pages by using CSS animations. You will learn how to apply transitions to property values. Next, you will learn how to apply 2D and 3D transformations to elements. At the end of this module, you will learn how to apply keyframe animations to elements. This module introduces web sockets, describes how they work, and explains how to create a web socket connection that can be used to transmit data in real time between a web page and a web server. This module describes how web workers operate and how you can use them in your web applications. Tools such as Node.js, Webpack, and Babel enable the use of new language features along with support for different browsers in order to avoid harming the user experience. In this module we will introduce the theory behind these tools, when we need to used them, and the different options for use. Create executable Java applications with a main method; run a Java program from the command line; including console output. Compare and contrast the features and components of Java such as: platform independence, object orientation, encapsulation, etc. Develop code that uses wrapper classes such as Boolean, Double, and Integer. "Recognise common exception classes (such as NullPointerException, ArithmeticExcpetion, ArrayIndexOutOfBoundsException, ClassCastException)"
Choose from one of Firebrand's accelerated courses listed below to add to this apprenticeship programme. These courses are delivered when apprentices have submitted evidence to their End Point Assessment gateway. These additional courses support apprentices in achieving a Distinction grade at End Point Assessment. When do Software Developer apprentices train? Firebrand’s apprenticeship programmes are based around a core suite of residential training programmes delivering fundamental knowledge and skills to support on-the-job activity. All training courses are held at our dedicated training centre in Wyboston Lakes, Bedfordshire. Basing delivery around our public training schedule allows Firebrand to offer apprenticeship delivery on an open cohort basis. However, where an employer can provide enough apprentices to form a closed cohort (typically between 8 and 15 apprentices per cohort) we can schedule closed-cohort training at our delivery centre. We run both open- and closed-cohort training for current employers; the delivery option selected depends on business needs, in terms of both required skills and operational logistics. Below we've listed the course dates for the training delivered at Firebrand's training centre against this programme. Who can enroll on a Software Developer apprenticeship? Apprentices don’t need lots of experience to enroll on a digital apprenticeship with Firebrand. Our digital apprenticeship programmes give individuals all the skills needed to be a digital expert in their new role. Is there an upper age limit for someone that wants to go on an apprenticeship programme? Individuals can enroll as long as they’re over 16 - there’s no upper age limit. With a desire to learn and a real interest in IT, Firebrand will teach individuals everything else they need to know to succeed. What's the minimum educational criteria for entry onto Firebrand's apprenticeship programme? We recommend having five GCSEs, including English and Maths, though we'll help apprentices meet the minimum criteria before the apprenticeship starts. However, there are alternatives open to apprentices if the criteria hasn’t been met. I have someone that I want to put on an apprenticeship but they have no GCSEs in English and Maths. Can they still enroll on an apprenticeship programme? Individuals can enroll on an apprenticeship without GCSEs. They'll need to achieve a Level 2 or above in a Functional Skills test prior to the apprenticeship. We'll arrange the delivery of the test to apprentices before they start. My potential apprentice has an IT based degree. Are they eligible? Individuals need to be learning new digital skills, not re-learning old ones. Firebrand’s digital programmes may not be suitable if candidates have extensive work experience or an IT-based degree in the area that is being upskilled. My apprentice doesn't want to learn through residential training. Can we still use Firebrand as a provider? Firebrand’s apprenticeship programmes are based around a core suite of residential training programmes delivering fundamental knowledge and skills to support on-the-job activity. Our block-release approach allows apprentices to acquire an entire skillset in one out-of-office period, rather than gaining skills incrementally in a day-release model. Residential training allows apprentices to immerse themselves in a specific product and understand how it can be effectively applied to tasks in their workplace, making them instantly more skilled and productive on their return. How much does a Software Developer apprenticeship cost? The total cost of this apprenticeship programme is £18,000. How much you pay as an employer will depend on whether your business pays into the Apprenticeship Levy. Read below for to learn more about how apprenticeships are paid for. Firebrand’s approach to apprenticeships and the breadth and depth of our course content means we deliver knowledge beyond the standard for every apprentice. Apprentices on our standard programmes receive exactly the same training, from the same skilled instructors, as industry professionals attending on a commercial basis; this is reinforced by more than 3000 online learning course options and support from Learning Mentors and Subject Matter Experts with senior-level industry experience. Set against the funding cap, this overall training package represents exceptional value for money. Our standardised cost model accommodates a high degree of flexibility, allowing employers to adjust the content of their training package to include required skills or products. We'll work with employers to make sure their package is comprehensive, covering business training needs while minimising any incremental costs incurred through change requests. Are employers or apprentices charged for the accommodation at Firebrand's residential training centre? There's no additional charge for accommodation and food provided as part of our residential training delivery. 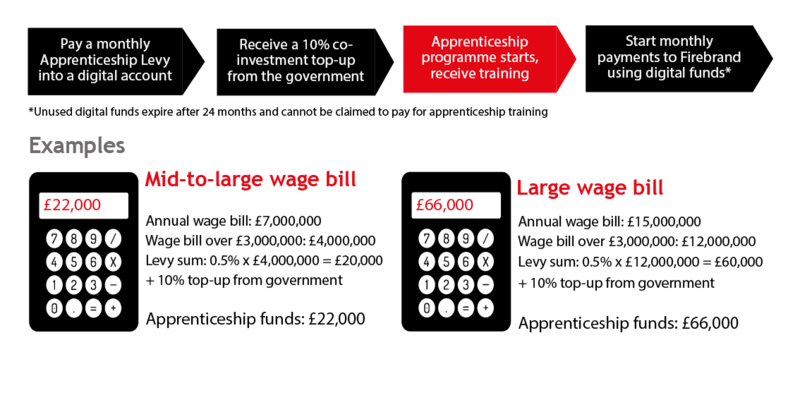 Where employers have an annual paybill over £3million, they'll pay 0.5% of that total paybill into the Apprenticeship Levy. Payments are made on a monthly basis, and they’ll show in the company's Apprenticeship Service account as soon as they’re made. How are Software Developer apprentices assessed? An End Point Assessment (EPA) is the final step in the apprenticeship journey for employers and apprentices. The assessment allows apprentices to demonstrate that they've developed all the competencies (skills), knowledge and behaviours outlined in the Standard to prove they're able to do the job they've been training for throughout their programme. Who delivers End Point Assessments? EPAs are delivered by independent End Point Assessment providers. The British Computer Society (BCS) is the organisation that assesses all Firebrand apprentices - it's the Chartered Institute for IT and is the professional body for the digital industries. All successful apprentices appear on the BCS Professional Register for IT Technicians (RITTech) free of charge, and are entitled to use the RITTech letters after their name. The EPA lets apprentices map out their digital skills by looking at examples of their best work. It’s designed to bring together all the completed work and skills they’ve learned into one portfolio. Upon completing their EPA, apprentices receive a grade for their hard work, either Pass, Merit or Distinction. The EPA is a chance for apprentices to prove to their employer, themselves and the assessor that they have certain knowledge and skills which have been officially recognised. What’s included in the EPA? While working in a new role, Firebrand Learning Mentors will help apprentices collect evidence of their best work. This is called the Summative Portfolio and it’s submitted as evidence of their digital skill development. The Summative Portfolio can be written, image-based, audio or video – whatever medium helps apprentices get the point across best. Apprentices complete a Synoptic Project as part of the EPA. ‘Synoptic’ means a general summary so it’s a learner's chance to test their new knowledge. The Synoptic Project applies new learning to problems outside a normal working environment. Apprentices spend three to five days away from work completing different skill-related projects. Firebrand Learning Mentors will then help submit the best project to the BCS as part of their overall portfolio. All employers are required to write unique references for their apprentices. They should demonstrate how they've applied the knowledge, competencies and behaviours in the projects they've been given at work. Firebrand will work with employers with guidance and a template to help them complete this throughout the apprenticeship programme. It's a great opportunity for employers to detail the rewarding relationship they’ve built with the learner, which is a reflection on their time as a valuable member in the team. All completed work is sent to the BCS, along with an employer’s reference. Apprentices then finish the EPA with an interview from an assessor at the BCS. This is a chance for apprentices to discuss all their completed projects and explain how they’ve developed the skills to meet the digital apprenticeship standard. Employers help prepare the apprentices for EPA, while also reinforcing their new digital skills. By writing a reference, employers get to detail what value-adding projects apprentices are working on and the benefits of their new professional relationship. Firebrand’s Learning Mentors guide apprentices and employers along the way. The Learning Mentors make sure the learner’s EPA submission is the highest quality of work possible. While also supporting the employee's learning, Firebrand provide various resources for employers, like a template for their employer reference. This makes the process easier and lets employers focus on writing the best reference they can. RITTech is recognised by employers and recruiters, demonstrating a higher level of skills and professionalism across digital and technology industries. With 'RITTech' after their name, it proves individuals are competent at what they do (RITTech is only awarded to people working at a SFIA Level 3 or above standard) and it shows they care enough to apply to be on this register. RITTech status demonstrates quality and professionalism for the individual, who they work for and to their customers. Employees with RITTech have proven they care about what they do, and the people who employ them will care as well. Some organisations even use attainment of RITTech as part of their professional development measures. Find out more about the End Point Assessment (EPA). What does a Software Developer apprentice's journey look like? Employers should know what’s happening at every step of the apprenticeship. That’s why Firebrand have identified how their employees learn and at which point they’ll get to apply their new digital skills. How does Firebrand support learning? Firebrand includes residential training, online training and plenty of work-based support from a dedicated Learning Mentor. Residential and online training is spaced throughout the programme to ensure the apprentice has time to learn and apply skills before moving onto something new. How do I ensure my employees are always learning? Firebrand schedules training carefully so that the learner gains skills they can use immediately at work. Residential courses happen from month 3 and are usually an average of 2 months apart. In between, there’s online learning and Learning Mentors activities (e.g. behavioural modules, Functional Skills). All apprentices complete several work-based projects for their portfolio. Learning Mentors support them with writing up each project over a 12-week period. There are three main sets of people who support apprentices – Firebrand’s Learning Mentors, Course Instructors and Subject Matter Experts. All of them have different responsibilities, but the benefit of Firebrand’s model is that apprentices get really good technical expertise, plus strong guidance on how to complete their apprenticeship successfully. Apprentices meet their Learning Mentors on the first day and discuss the full apprentice programme in depth. The Learning Mentors begin understanding the learner’s personal approach, level of knowledge and learning style. Learning Mentors help if the learner is stuck on something. They use their industry experience to guide apprentices in the right direction, helping them solve tasks from a different perspective. While also providing support, Learning Mentors check to see if the required standards are being met when completing work-based projects. Apprenticeships combine a full-time job with formal learning. Firebrand’s formal training includes between three and five specialist IT courses. These courses are decided by the employer during the on-boarding process. When apprentices are on a Firebrand course, they’ll be in Wyboston Lakes, Bedfordshire at Firebrand’s all-inclusive training centre. They’ll receive accommodation, food and a free shuttle bus from the train station. They then return to work and apply what they’ve learnt, tailoring new knowledge to their organisation’s technologies. As apprentices reach the end of the apprenticeship, Firebrand’s Learning Mentors will help them get ready for the EPA. See the End Point Assessment (EPA) section for more information. How do Software Developer apprentices progress? The pace of digital transformation means there’s always going to be new technologies and smarter processes in businesses. Progress to the next level and learn even more new digital skills. Progression is a natural step in the IT industry and it keeps employee's skills refreshed. Develop and reinforce technical knowledge by advancing to a higher-level apprenticeship or training on Firebrand’s public courses. Gain certifications on public courses from vendors like Microsoft, AWS and CompTIA. For apprentices at the end of their Level 3 apprenticeship, advancing to Level 4 is the next natural step. Learn further digital skills while in a more specific IT related role. Specialised Level 4 roles include being a Data Analyst, Cyber Security Technologist or Network Engineer. Rather than just understanding an organisation’s technologies, learn to master them. Level 4 apprentices apply previous skills with new technical knowledge to gain greater responsibility in a digital role. Take a look at our Level 4 apprenticeships to continue developing your IT career. After a Level 4 apprenticeship, apprentices can enhance certain specific skillsets and gain further product knowledge by taking Firebrand’s public courses. Public courses are the best option after successfully completing a Level 4 qualification. They align individual courses with desired IT skills. Start choosing certifications from over 700 public training courses. While apprentices benefit from new digital skills they can use in their job, almost all digital apprenticeships that Firebrand offer provide the chance to gain industry recognised qualifications. Apprentices gain qualifications through either BCS or Vendor specific exams where applicable. These qualifications add to a professional career and can be used to help move seamlessly between roles in the IT industry. © 2001 - 2019 Firebrand Training is a registered trademark. All other names and terms are trademarks or registered trademarks of their respective companies.